Update 9/5: Footage from the attack is reportedly now available here. On Saturday, assailants attacked the Panamanian-flagged container ship COSCO Asia with machine gun fire as it transited the Suez Canal near the el-Qantara area. Egypt reportedly arrested 3 involved in the attack. 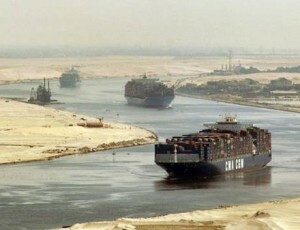 Fellow CIMSECian James Bridger had an insightful post on the Suez Canal’s security situation earlier last month, warning that a range of actions could be taken with the aim of disrupting traffic through the canal, primarily as a result of islamist retaliation against Egypt’s military coup. 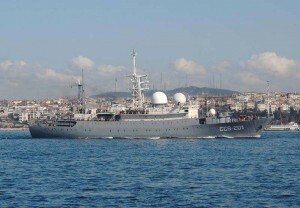 To the north, Russia sent the surveillance ship Priazoye from Sevastopol on the Black Sea to monitor U.S. naval forces off Syria. The news came while the number of U.S. forces gathering in the region increased as the Nimitz carrier strike group (CSG) moved into the Red Sea to await further orders instead of returning home to Everett, Washington after its deployment. The CSG includes the Ticonderoga-class cruiser USS Princeton and three Arleigh Burke-class destroyers: the USS William P. Lawrence, USS Stockdale, and USS Shoup. The strike aircraft aboard Nimitz and ships’ cruise missiles add to the seapower already assembled in the Mediterranean – the destroyers USS Stout, USS Mahan, USS Ramage, USS Barry, and USS Gravely. An unknown submarines are also in the area along with the amphibious ship USS San Antonio, a dock landing platform that earlier transited to the Eastern Mediterranean. Previous PostMore Than Meets the Eye in Asian Naval RaceNext PostHas South Korea Lost the East Asian Stealth Race? German international broadcasting station “Deutsche Welle” has asked me to comment on deployment options in the Easter Med. This is a subject that very rarely gets media attention in Germany. Here is the link to the article, including a little map.